CONTACT: Susannah Greenberg, Public Relations, NY, 212-208-4629, publicity@bookbuzz.com. For a review copy or other requests, please use our online form. INTERVIEW: C.B. Murphy, author of new humorous novel Cute Eats Cute, artist, photographer, and Minnesotan. AVAILABILITY: Nationwide by telephone and Skype video call. Minneapolis/St. Paul and environs. Here is a hilarious, surprising, tender, always genuine tale of American youth in the cross hairs of the new century; a battle of growing pains culminating in a bloody headlock with nature, family, machismo, activism, and love. C.B. Murphy has written a terrific and timely novel which speeds by and ends, like youth itself, far too quickly. One funny and thoughtful read, no matter what age you happen to be. Uses a quiver-full of humorous arrows to shoot holes through a herd of politically-correct facades on the way to hitting the bulls-eye on life about love, death and hunting. An enlightening read for all those who find deer devouring their shrubbery and stepping in front of their cars. Brings together major aspects of the culture wars that bedevil us, animal rights, wildlife management, abortion rights, and gun control. In a romp through these battlefields that both entertains and instructs, C.B. Murphy offers a mirror in which to see ourselves, warts and all. St. Cloud, MN -- October 26, 2010 -- C.B. 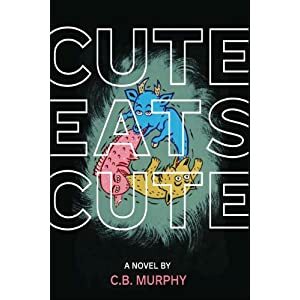 Murphy's compelling debut novel Cute Eats Cute, a humorous and ironic coming of age story, set in a Minnesota town, will be published by North Star Press of St. Cloud, MN on October 26, 2010. In Cute Eats Cute, 15-year-old narrator Sam is forced to confront an adult world filled with posturing, pretense and the pursuit of personal issues and agendas. Sam's mom, Elissa, is into New Age spirituality, and dad Jeff works for the Department of Natural Resources, which has just announced that it plans to slaughter "excess" deer in urban parklands. Mom is against it and dad is pro-hunter and so the trouble begins. Cute Eats Cute, the title taken from a speech Sam's dad makes at his high school defending the urban deer hunt, encapsulates how animals eat one another for survival and defense. The satirical jabs at the men's movement, the deafening but impressionable rhetoric of the gun-toting right wing group, The Hunters of Men, and the fragile friendship of Sam's school chums (who are each facing down their own personal issues against their blind ecology crusade) all conspire to make Murphy's novel one that will make readers laugh as they consider the paradox and folly of the human condition. For several years, Murphy was a cartoonist for The Chicago Reader which ran his weekly comic strip, "C. B. Murphy." The Chicago Museum of Contemporary Art selected his book, January is Alien Registration Month, for its permanent Artists' Books collection. 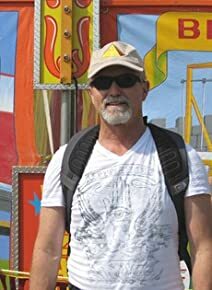 His artwork and illustrations include, The Second Mongolian Invasion, Nuclear Pup, and Masonic Kabbalah Circus, all of which are in the University of Cincinnati collection. Murphy's short films have screened across the U.S. including at the Walker Art Center in Minneapolis and the Willis Gallery in Detroit. Distributed by Partners Book Distributing, Holt, MI. 800-336-3137. Humor plays a big role in Cute Eats Cute. Who are your favorite humorous writers? What do you find funny? I didn't set out to write a funny book, but I see life in a tragic-comic sort of way and it comes out that way. My immediate answer is to think of film makers and TV that I find funny. The Coen Brothers, of course, in Big Lebowski and Fargo, In television, I'm still watching Arrested Development. I like Carl Hiaasen Sick Puppy, George Saunders, Nick Hornby, and David Sedaris. Sometimes the best humor is part of a cultural critique you find in Ian McEwan or Michel Houellebecq. It's a common answer, but true: they are combinations of different people in the beginning, but then they take on a life of their own. Sometimes I even have to “interview them” to find out what they think. It's scary, like channeling. Your main character, Sam, is a teenage boy. Was it challenging trying to write in the voice of a teenager? Did you have to draw on your own teenage years? Early draft of the book had three points of view, including Sam's parents. But Sam's voice came out so loud and insistent, I let him tell the story. Actually, I don't think he's very much like me. I grew up on the cusp of the 60s, went to a Catholic boy's school in a Catholic ghetto in suburban Detroit. Our issues were very different. I did have my own kids late in life, but they were younger when I was channeling Sam. Describe the character Sam and how he changes in the course of the book. Sam is a kid who on the one hand thinks he knows what's wrong with the adult world but isn't quite ready to enter it with conviction. People around him, like Megan, seem clearer about where they are going and he's faking it a bit, still weighing his options. The fact that his parents' disagree on so many things is an obstacle but also a blessing. It's harder for him to just go with one side on an issue because at least one person he loves is over there. His politics are more in line with his mom, but he seems the flaws of her logic so that's unnerving. He's curious about his dad's world and how a nice hippie could have ended up there. He has a richer world of choices than many kids, but that's also challenging. Describe his dad Jeff and mom Elissa and their relationship to their children and each other. Jeff and Elissa felt they were very similar in world views in college, but over the years their views grew apart. This strains a relationship, but it can be overcome with love. I think they are in love and somewhat respectful of their differences, but both also convinced their influence on their kids (and hence "the world") is important, so they are in there like everyone one else overselling how they see the world. They're rather typical if somewhat exaggerated Boomer know-it-alls. How much is the town portrayed in your book like Minneapolis/St. Paul? The community portrayed in the book is very much like the Twin Cities. Minneapolis/St Paul is homogenous in some ways perhaps, but it is also a very counter cultural city. It's a place where diversity is sought out and celebrated until it makes someone uncomfortable. Minneapolis was home to Robert Bly, author of the international bestseller Iron John: A Book about Men, credited with starting the Men's Movement, a movement which in large part began here. There are many strong subcultures from a large gay and lesbian community, through old school Lutherans, and now Somali, Hmong and Native Americans. It's a more diverse and interesting place than it gets credit for. The plot centers around the potential slaughter of excess deer. How do you think animal rights activists will react to your book? Hunters? How do you hope they will react? I was trying to write something that showed the humanity of people on each side. I think this is surprisingly rare in any fiction written about environmental issues, where usually the authors are eager that you see things their way. Preaching is rampant. And boring. I think everyone has part of the answer and that's the problem, too. People don't really like talking to others who disagree with them. We're not as good at is as Europeans. My brother-in-law who lives in Paris told me that. New Age spirituality is the source of a lot humor in your book. What is your personal experience with it and why is it so funny to you? My high school was Happy Days but my early college years was all hippies and SDS. I've wandered many paths including some Wicca-lite, Native American sweat lodges with white guys, drumming in the forest with the Men's Movement, and Toastmasters just to name a few off the top. I've put my time in. I don't fault anyone for searching but sometimes it's funny when people don't see the irony of us being in a big swirl of world cultures and ideas, many of which seem contradictory. I did a little hunting with my dad years ago. I wanted to write something that showed how good people could be on all sides of a controversy and that doesn't always make for a happy ending. I'm finishing up a novel now titled "The End of the End of Men." It's about some college friends who were wild film makers then took separate life directions and reconnect years later. It's "Bonfire of the Vanities"ݠmeets "The Magus."